While modern UK tram systems are somewhat bereft of aesthetic charm (as discussed here), their predecessors in the first half of the twentieth century sometimes produced some very attractive pieces of design. We tend to think of early tram systems as very old-fashioned, and indeed many of them seem so to today’s eyes, especially the ones which were dismantled or replaced with trolleybus systems in the first couple of decades of the twentieth century, and which never had the chance to develop beyond a Victorian design ethic. But some of the systems which hung on into the 1930s and beyond, produced some very modern, very attractive pieces of design, and bequeathed us some impressive survivors. Art Deco and Streamline Moderne in particular had a significant influence on some of the tram networks which survived the longest. Just as the mainline railways looked to Streamline Moderne to enhance their image in the public eye, so did some tram systems. Clothing mainline steam locomotives in streamlined casings was a sham; dressing an old-fashioned technology in the clothes of a new one. Trams (electrically powered, zero emissions at point of use, virtually silent) on the other hand, were a genuinely modern technology, well deserving of such modern styling. 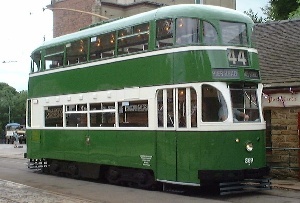 Liverpool’s curvaceous “Green Goddess” trams are a case in point. All but one of even the longest-lived tram networks in the UK have since vanished. The Blackpool tramway is the only survivor of the early twentieth century systems. All the others are modern, constructed at the end of the century and the beginning of the twenty-first, many years after the cities in question disposed of their original networks. 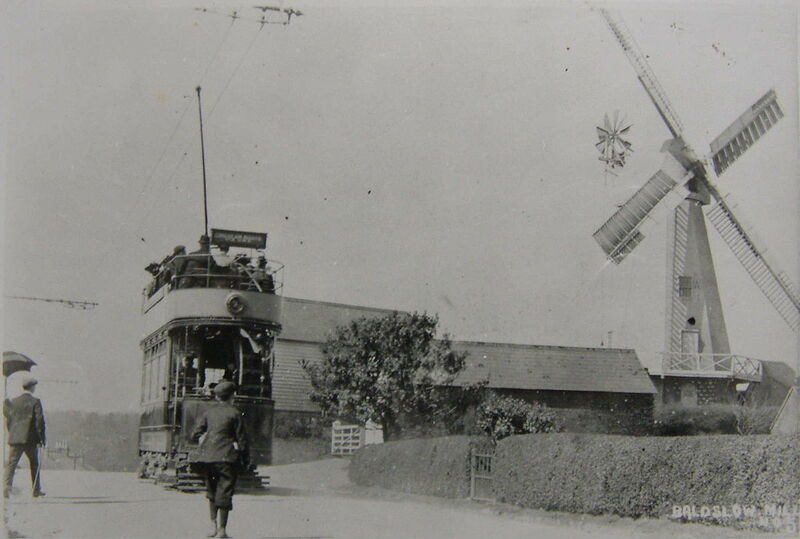 Brighton, on Britain’s south coast, is one city which has lost its tramway. But it hasn’t lost everything. Brighton’s most famous building is the Royal Pavilion, a bizarre and flamboyant piece of sunny faux Orientalism plonked on the grey and drizzly shores of Britain at the behest of King George IV (one of the less popular members of the British royal family). It’s Grade I listed by statutory heritage organisation Historic England and is probably one of the most eye-catching buildings in Britain. Yet readers of this blog may find their eyes drawn instead to a collection of buildings just outside the Pavilion. On Old Steine stand some rather super survivors of Brighton’s tram system in the shape of three waiting shelters. 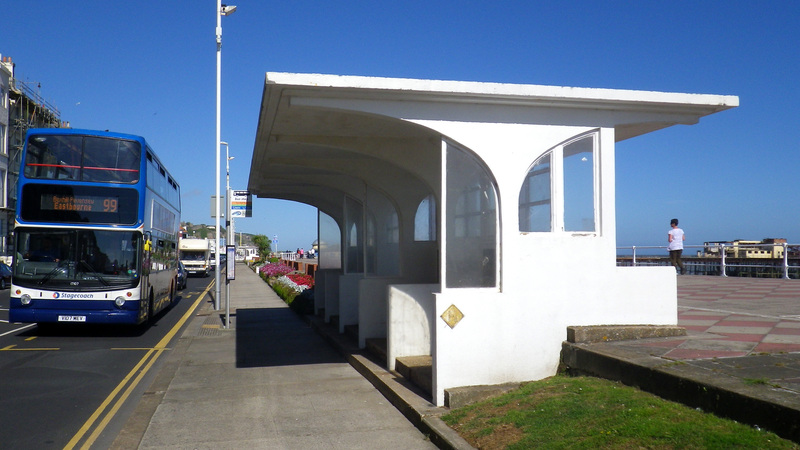 Estimated to have been constructed around 1926, probably by Borough Engineer David Edwards, this trio of tram shelters are in what Historic England terms “International Style”. But they look Streamline Moderne to me. They have rounded ends, and matching overhanging roofs. Construction is of concrete, with metal glazing bars. They are open to the road side (for getting on and off trams) but glazed on the pavement side (for preventing draughts). 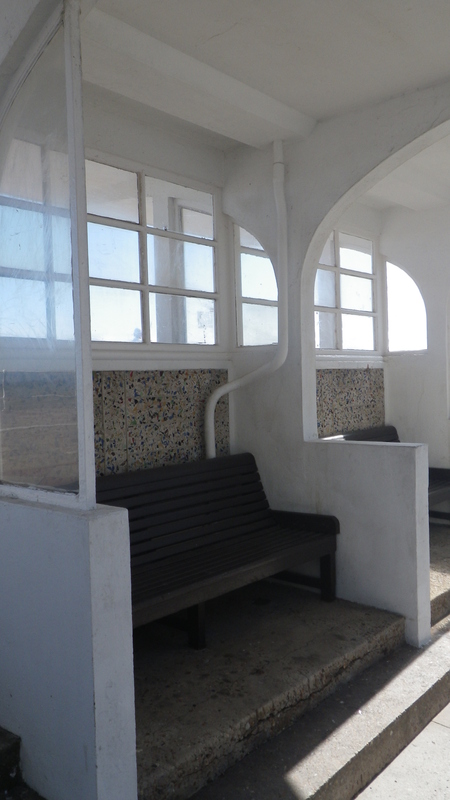 Historic England’s predecessor English Heritage listed the shelters at Grade II. Best of all, they are still in use in as bus shelters to this day. They are nearly 90 years old but continue to serve the public transport users of Brighton admirably and stylishly. Further south on Old Steine, on the other side of the road, is a larger tram shelter (also Grade II listed) which incorporates public toilets as well, but the design is very similar (it now houses a cafe). Intriguingly however, the Sussex Industrial Archaeology Society claims it has evidence from the archives of Brighton Corporation’s Land and Works Committee that English Heritage got its facts all wrong. 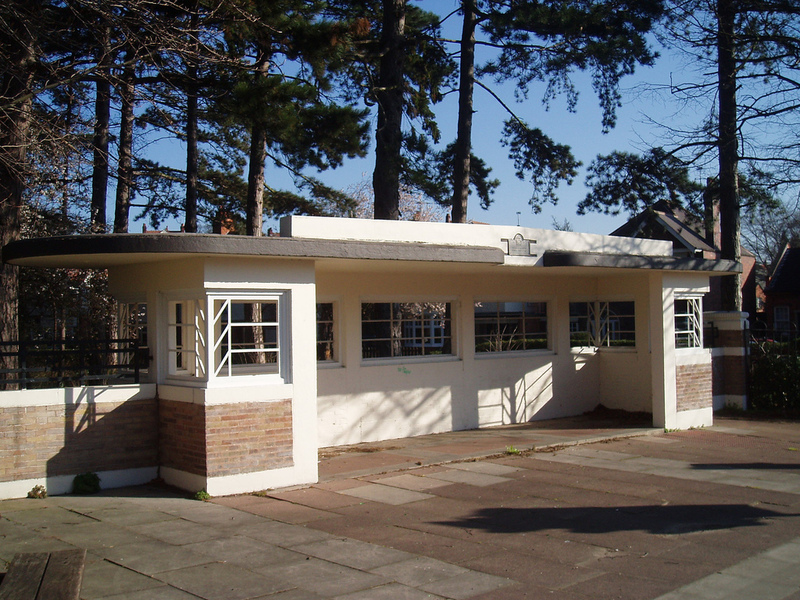 The Society says the larger shelter dates from 1936, while the three smaller ones were built much later, in 1950, to match the earlier shelter. In that case they never served Brighton’s trams at all, but rather their trolleybus replacements. If you’re the kind of person who admires the waiting shelters on the platforms at East Finchley tube station in London (which are considerably more famous), then you’ll love these and wonder why they’re not better known (hopefully this write-up can contribute to putting that right). Meanwhile, in the Midlands city of Leicester, a set of five Art Deco tram shelters have a rather unusual history. They were built during the 1930s as a donation to the city by local businessman Robert Rowley, who made his money in the hosiery business (more details here). One of the five (the one on Western Boulevard) was built in advance of the city’s tramway, in anticipation of a line which unfortunately was never constructed. It has stood, used for shelter but never by tram passengers, ever since. Four of the shelters are of the same basic design, rectangular and with lozenge-shaped overhanging roofs. They are open along most of the side facing the road (with a low parapet above the roof carrying a plaque commemorating their donation) while the walls are glazed on their upper halves for most of their length. The windows are barred metal, with a distinctive chevron design on the corner windows. It’s not easy to tell for certain (as, unhelpfully, English Heritage hasn’t listed them) but as far as I can tell they are constructed of brick, partly rendered and painted white. 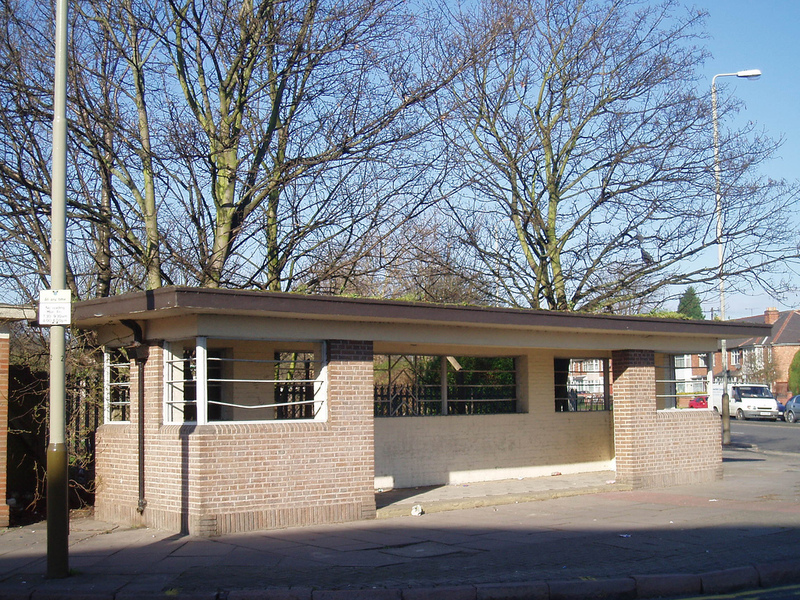 The fifth shelter, on Fosse Road North, is of a slightly less elaborate design, not as tall and with simpler windows (though the chevron design is included in the central rear window), and a rectangular overhanging roof. The full set can be seen on Ned Trifle’s Leicester Art Deco tram shelters flickr page (his explanatory text at the top of the page says his photos have been reproduced elsewhere without credit, which must have been very annoying; this blog meanwhile is happy to do things properly). None of the Leicester tram shelters now have a transport use, and a local businessman wants to turn the Western Boulevard shelter into a coffee shop (as you can read here; I do hope he succeeds). The shelter (there are four others along the sea front, plus another three associated with an underground car park; a story for another time) was designed by Hastings Corporation’s Borough Engineer Sidney Herbert Little (1885-1961) some time between 1925 and 1939, as part of a wider scheme to improve the seafront in Hastings. 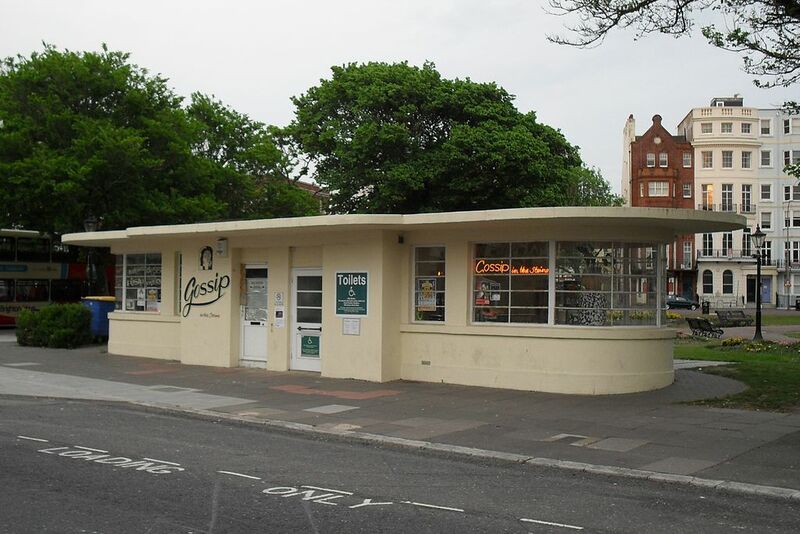 It is listed, along with its compatriots, at Grade II by English Heritage, which calls it an “unusual and striking” example of Nautical Moderne architecture (which I’m inclined to treat, like Streamline Moderne, as a subcategory of Art Deco). They are a pleasing complement to the extremely fine Art Deco / Nautical Moderne residential building Marine Court of 1938 (fine in its day at any rate, rather neglected now), which is intended to resemble an ocean liner, and is located nearby on the seafront. 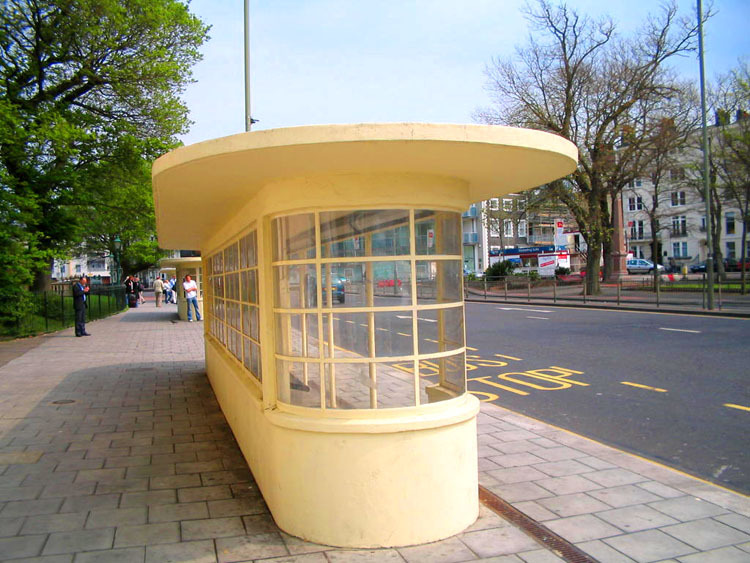 This article was updated in January 2017 to include information from the Sussex Industrial Archaeology Society about Brighton’s tram/trolleybus shelters. You do say the nicest things, so I’ll carry on then. If you like rounded ends, you might enjoy the entry planned for 25 September (assuming the subject doesn’t change between now and then). I’ll eventually get round to the Met line waiting rooms, but for now I’ve got fascinated by the fact that there are transport buildings which are often as good as famous examples like those, but which no-one seems to know about! Thanks, great article. I think there are some great disused tram shelters in Northampton. A few of which have a hint of deco about them.